CHANNEL STRIP complete, Software channel strip from Metric Halo. Despite the preponderance of exceptional drum samples and loops on the market, for certain genres of music (notably country and rock) there is no substitute for a great session drummer playing on a well-recorded and mixed drum kit. One thing that samples and loops can’t provide is the great rhythmic instincts an accomplished live player draws upon when responding to a specific song. However, getting a great player (while certainly a significant element) is not the entire story. Despite the preponderance of exceptional drum samples and loops on the market, for certain genres of music (notably country and rock) there is no substitute for a great session drummer playing on a well-recorded and mixed drum kit. One thing that samples and loops can’t provide is the great rhythmic instincts an accomplished live player draws upon when responding to a specific song. However, getting a great player (while certainly a significant element) is not the entire story. The appropriate treatment of the drums in a mix with EQ and compression can make the difference between a lifeless, vague sound and an exciting, textured and genuinely rhythmic drum track. 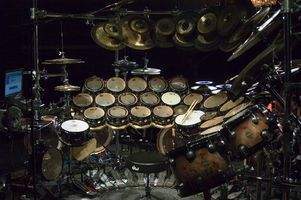 Even though the drummer plays the entire kit as a single instrument, the miking of individual drums and cymbals can make for a very complicated mix scenario. The reason I reference country and rock music specifically has to do with the fact that in these genres the sounds of the individual drums and cymbals are not only singled out by individual microphones placed on each of them but also their sounds are exaggerated to create an even more dramatic effect. Consider, for example, the tom fills in Phil Collins’ “In The Air Tonight.” By contrast, jazz drums are often treated as a more cohesive, unified sound and it’s not unusual to use a simple pair of overhead mics to capture the sound of the entire jazz drum kit. 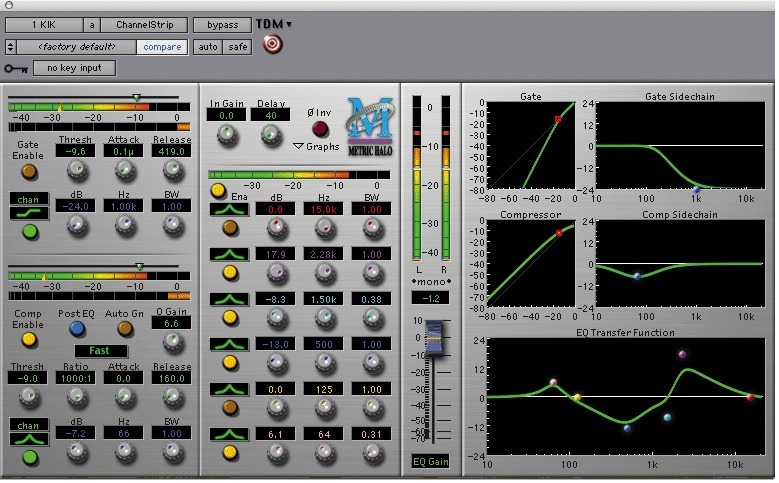 In this article, I’m going to go drum by drum providing EQ and compression settings that will, hopefully, provide you with a jumping off point to getting great drum sounds in your mix. Because of its all-in-one mixing board channel approach, I’ll be using Metric Halo’s Channel Strip plug-in with its EQ, compression and noise-gate to illustrate my comments about various EQ and compression settings. As the heartbeat of the contemporary drum kit, the kick drum sound we’ve grown accustomed to hearing is both boomy and round on the bottom and has a nice, bright click in the high mid range. 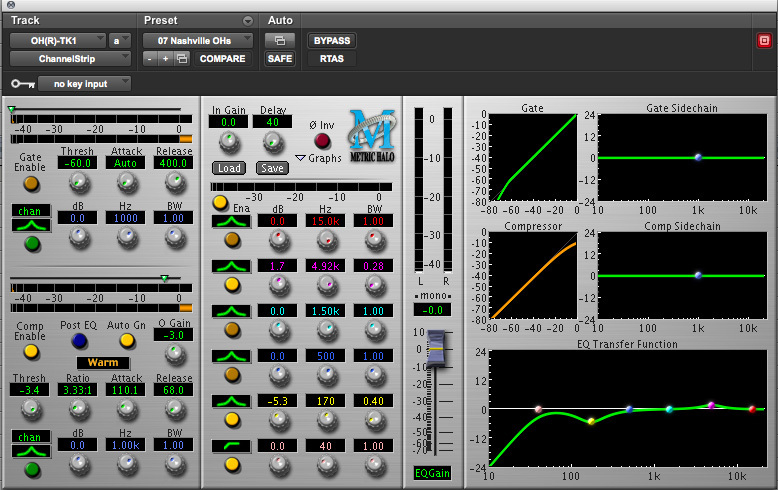 It’s the balancing act between EQ and compression that gives the kick drum its ability to stand out in a mix. Beginning with EQ, the best way to accentuate the lows and highs is to remove some low-mids. I’m a big believer in cutting as opposed to boosting EQ to achieve a desired effect. As a result, I tend to pull somewhere between 2 to 4db at between 350hz-450hz. Then, after removing some of this low-mid mud from the sound, I can enhance the clicking sound of the beater hitting the head of the kick drum by boosting around 2db in the 2k-3k range. I’m providing approximate dB and frequency range settings because depending on the kick drum, mic placement and, of course the drummer, all of these settings will vary. Use these general ranges as a jumping off point and then trust your ears. 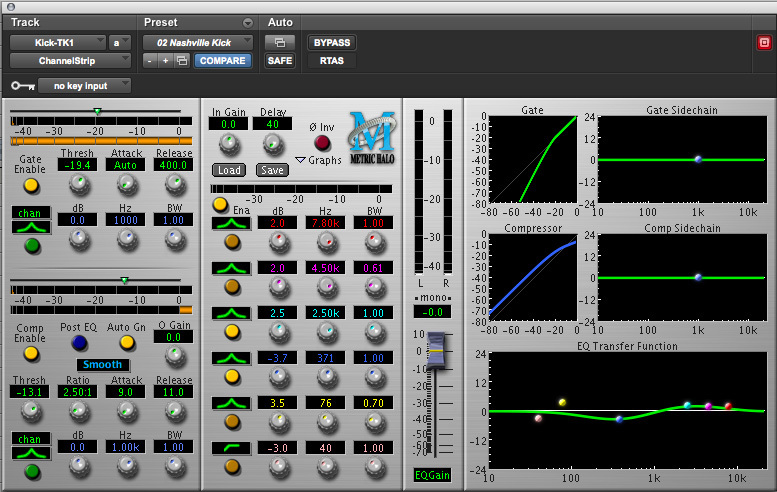 As far as compression settings go, the trick is to preserve the transient attack of the kick drum with a fast but not too fast attack time (9ms in this instance) and then a quick release (11ms) so the compressor is ready to respond to the next kick drum hit. The ratio I use is a relatively mild 2.5:1 and I adjust the threshold until I hear the kick sound I’m searching for. Finally, in order to give the kick drum sound some separation from the rest of the kit, I use a noise gate and adjust the threshold to allow the kick sound to come through while essentially muting the majority of the other drum/cymbal sounds. Also, while setting the attack to the Channel Strip’s fastest “auto” setting, I allow for a long (400ms) release. This particular miking trick is one that can be used to bring great low-end presence to the kick drum. By way of explanation, a short stand holding essentially the woofer of a speaker is placed in front of the kick drum and picks up predominantly the low frequencies. 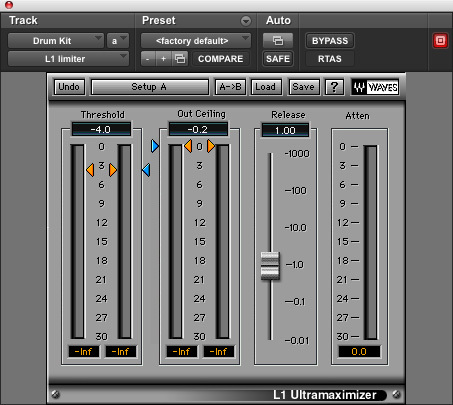 When blended with the kick drum mic, the sub-kick generates great power in the lowest part of the frequency. In order to accentuate the most important elements of the sub kick’s sound, I tend to use a low pass filter approach to my EQ that removes all frequencies above 500hz and drops off even more dramatically below 100hz. This is to make sure that only the essential parts of the sub kick’s sound come through. The sub kick should be felt more than it is heard. 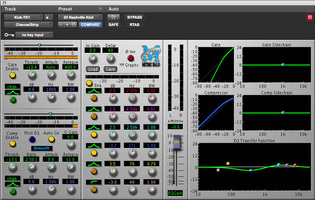 In terms of compression, a ratio of approximately 5:1, a relatively slow attack (120ms) and medium fast release (57ms) allow the sub kick’s tone to stay present and full underneath the sound of the kick drum’s regular miked sound. Then, I’ll use a noise gate with a fast attack (20ms) and slower release (200ms) to keep out any other kit sounds that might otherwise bleed into the sub kick sound. Along with the kick drum, the snare drum is essential for driving a rhythm track. 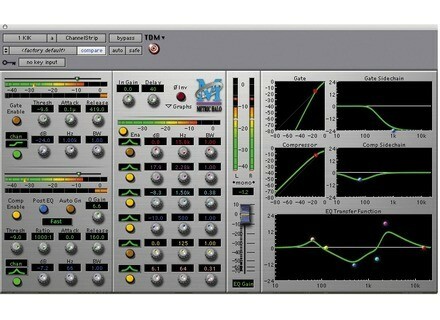 Poor EQ and compression techniques can leave it sounding thin, dull and generally uninspired. In order to accentuate the best parts of the snare sound with EQ, I’ll boost the low end of the snare by 2-3dB at around 80hz, cut 2-3dB between 350-450hz and then boost again, if necessary, for more high-end brightness, by 1-2dB at 5k. These three EQ points are a great place to start to sculpt an interesting snare sound. Compression on a snare is a real balancing act where too much will take away the energy of the performance and too little will make it practically impossible to find an appropriate level for the snare in the mix. I use a ratio of 2.5:1 with a very quick attack (2ms) and release (11ms). If you’re finding that you’re losing the snap of the snare, slow your compressor’s attack a little but remember that slowing the attack too much will take the compressor too long to grab onto the sound and will leave the snare much less manageable in the mix. Adjust the threshold settings until things sound right to your ear. This basically allows you to decide how much overall compression you’ll be applying. 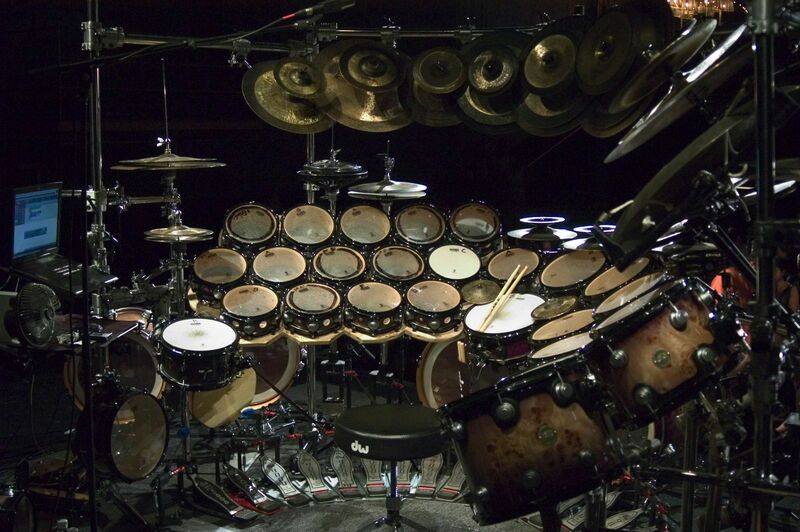 Don’t overdo it or the drum will lose its energy but don’t go too lightly or the snare won’t stand up in the mix. Gating the snare is a trial and error process as well. Depending on whether the snare approach in the song is aggressive or soft will have a lot to do with your threshold settings. Like on the kick drum, I use the very fast “auto” attack and a slower release on the gate in an attempt to keep out the ambient sounds of the cymbals, toms and kick. While obviously a cymbal, the hi-hat is often used more as a rhythmic element than a tone color like some of the other cymbals in a drum kit. Making sure it has its own sonic space and speaks clearly without being too loud and distracting is what EQ and compression are about in this instance. For EQ, I’ll again use a shelving approach at around 200hz that will effectively clear out low-end information that is non-essential to the hi-hat sound. If I’m interested in bringing in a bit more high-end shimmer and sizzle, I’ll boost between 1-3dB between 6k and 8k again using my ears to tell me what’s working. In general, I tend to stay away from compression on the hi-hat as it tends to find is own dynamic range without too much additional help. A well-mixed set of toms can make all the difference between drum fills that are exciting and those that go by without catching the listener’s ear. Starting with the low tom, I tend to look for the places in the frequency range that bring out both the boom and the snap (similar to the way I approach the kick). In order to accentuate the low quality of this drum, I’ve found that a dramatic cut (12dB) at around 500hz allows the drum to speak clearly. 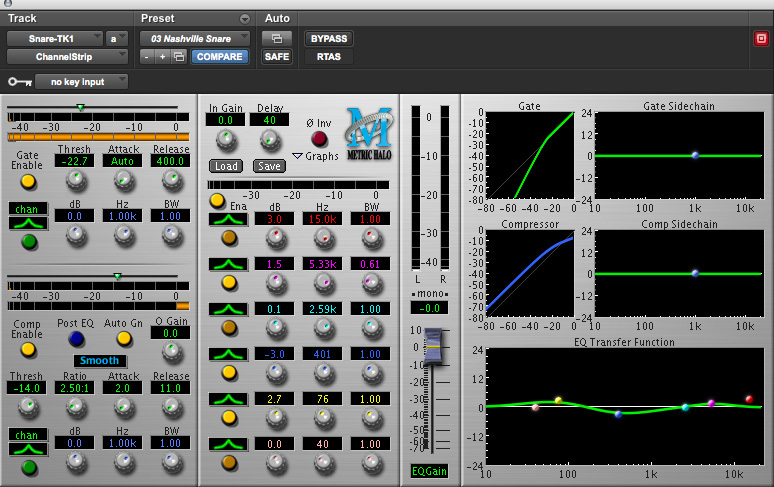 Also, to add the high-end snap, a semi-aggressive boost of between 4-6dB at around 3k will do the trick. Compression also adds a lot to this equation. A ratio of around 4.5:1, a slower attack of 120ms and medium slow release of around 90ms will help the sound remain full and resonant. For the threshold, I simply adjust until the tom rings properly. Gating is another major factor for toms as the large diaphragm mics placed on these drums tend to pick up a lot of the extraneous sounds from the rest of the kit. I set the gate with the quickest “auto” attack and a slow 400ms release and then adjust the threshold until I’m hearing only the low tom come through when it’s hit. For the “tweak heads” among us there's a slightly more accurate and labor-intensive way to do this. By going into the actual sound files in your DAW and deleting all but the tom hits themselves, you can create a perfectly gated tom track. Like the low tom, the high tom has it’s own frequencies that should be cut/accentuated to bring out the sweetest parts of the sound. For EQ, I’ll do another big cut of around 10dB at 600hz and I’ll make a similarly big boost of around 7dB at approximately 2k. 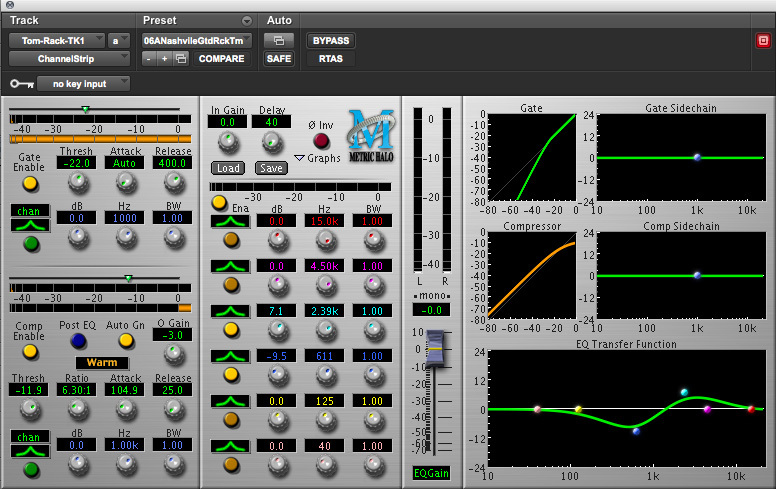 For compression, I use a slightly more aggressive 6:1 ratio slower attack (100ms) and a quick release (25ms). As with the low tom, I’ll gate the high tom using the identical gate attack (fastest “auto”) and release (400ms). The key to the threshold is to adjust it until only the high tom punches through keeping the channel essentially muted for the rest of the time. A final note on the toms, as all tom sizes, tunings and even drummers are different, you’ll need to play with these settings until you find the sweet spots. Given that we’ve made a real effort to isolate and enhance each of the individual drums in the kit, overhead mics serve the dual purpose of capturing the cymbals and integrating the blended sound of the kit back into the sound of the drums. I pay attention to three specific EQ points in order to give the overhead mics a clean, balanced tone. First I’ll use a high pass filter (shelving EQ) at the very low frequency of 40hz to clean up any unnecessary sub-sonic rumbling. Then I’ll pull around 5dB at between 100 and 200hz to prevent any low-mid buildup. Finally, if necessary, I’ll enhance the overall brightness of the cymbals/kit with a small 1-2dB boost at around 5k. For compression, I’ll set the ratio at about 3:1, the attack at around 110ms and the release at a slightly quicker 70ms. The threshold should be adjusted to make sure that the overhead/room sound blends with the overall kit mix. Finally, adjust the volume of the overhead mics in the mix until you pick up just enough of the room to put some air and depth back into the kit. 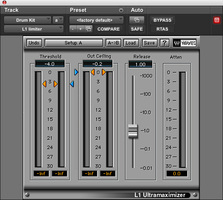 A final trick to add punch to the overall drum kit is to send all of the individual tracks to a stereo sub mix and place a limiter like the Waves L1 on that stereo auxiliary track. By adjusting the threshold until the attenuation is between 5-7dB, you’ll find that the kit has a really satisfying overall punch and presence. While I’ve been painfully specific about EQ, compression and gate settings, it’s important to remember that every mix situation is different. Use all of these settings as a jumping off point and then use your ears to tweak the sounds until you’re happy. Good luck!